Two brilliant Harp Concertos, different in style, but both masterpieces in their genre. Boieldieu was a master of the early - romantic French style at the beginning of the 19th century, abounding in charm, lyricism and brilliance, whereas Ginastera delves deep in disturbing, fierce 20th century expressionism, demanding extreme virtuosity and stamina from the harp and its player. Excellent performances by German harpist Jutta Zoff, winner of important international competitions, backed with both delicacy and force by the famous Dresden Staatskapelle. 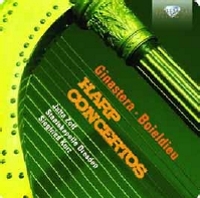 Total playing time 45' 07"
This disc explores that rarity of the classical repertoire, the harp concerto. The musical characteristics of the harp can provide somewhat of a challenge for the composer if writing a concerto for the instrument, but this disc boasts two wonderful examples that show seemingly endless possibilities. Frenchman François-Adrien Boieldieu (1775 - 1834) was probably best-known for his 40 operas, but after developing a close friendship with Sébastien Érard, the piano maker – who was investigating and implementing improvements to the harp mechanism – Boieldieu began to write pieces for the harp. With the lyricism of the instrument showcased in the second movement Andante, over slow-moving strings, and fast finger-work dominating the Allegro agitato finale, Boieldieu’s concerto stands in marked contrast to that of Alberta Ginastera’s. Here, after a fiery, almost aggressive opening few bars, the music gradually progresses towards the eerie chromaticism in the second movement. An extended virtuosic solo cadenza then marks the beginning of the finale, in which a series of tense chords hail the abrupt ending of the piece. The concertos are performed by Jutta Zoff, who was at the peak of her glittering career at the time of recording. The German harpist had been a favourite soloist of the Staatskapelle Dresden since 1967 and enjoyed tours of Europe, the USA and the Middle East. The orchestra is conducted by Siegfried Kurz.